"My momma always made this for those hot summer days we would all go to the creek or floating on the many creeks we have around here." Place the potatoes in a large pot and fill with enough water to cover. Bring to a boil, then reduce heat to medium and cook until tender enough to pierce with a fork, about 15 minutes. Drain and cool slightly. Remove the peels and cut into cubes. Set aside to cool completely. In a large bowl, mix together the onion, salad dressing and mustard. Stir in the hard-cooked eggs and cooled potatoes. Try not to mash the potatoes very much. Season with salt and pepper. 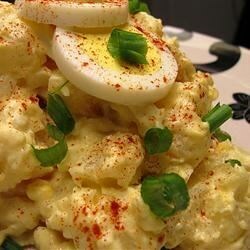 Chef John's tips for perfectly great potato salad! It was pretty good. I only had 3 pounds of potatos so i put the serving to 7. IT TOOK 2 HOURS to make this but i boiled my own eggs. I followed the recipe to a T except i put paprika in it. This is good back lacking something, so I added al little bit of sweet pickle relish and paprika and tasted better. I also put a little chopped celery. I've made this recipe for years but with my own twist. I add diced onion & celery and mix the Miracle Whip with Ranch Dressing. Everyone loves this and its great for get-togethers!